In June, Wilder, a James Beard award-winner (2000, Best Chef: Southwest), represented Tucson at a reception in UNESCO’s Paris headquarters before the annual Creative Cities Network conference. In preparation he crafted the menu at his restaurant, Downtown Kitchen + Cocktails (DKC). It included local flavors he had to pack with him to France: poblano flautas with saguaro blossom syrup, a spicy shrimp dish sautéd with pickled cholla buds and Tamarindo Truffles, among other items. He moved to Colorado in the late ’70s for a job as chef at the historic Gold Hill Inn near Boulder. There he learned about cooking with a “sense of place”—the idea that if you close your eyes while eating, the flavors and aromas will tell you where you are. Rather than watching distributors drop off groceries, he was buying trout directly from local fisherman, beef from ranches on the nearby plains, and fresh mushrooms foraged in the fields. “It was the authentic culinary expression of the region,” he says. Like many great chefs in America, Wilder also traveled to Bordeaux early in his career to study classical French cooking. Working at fine French restaurants, he ventured further into what would become known as farm-to-table cooking. “We’d go to market and write the menu on the way back home. This was institutionalized in France,” he says. When he returned to the States in the early ’80s, he brought that concept home with him to the borderlands of Tucson, where he and wife, Patricia, settled to live closer to her family in neighboring Nogales. He and his wife spent a lot of time visiting restaurants along the border, sampling what he refers to as “cultural culinary icons.” The Sonoran style of food, flavor, and tastes that she introduced him to included chile rellenos, shrimp, and tacos. “I was exposed to the typical foods and cooking methods of the region … how they marinated meats, what kinds of salsas they used for what dish, how they cooked mojo de ajo fish … I learned a lot just by eating out a lot,” he says. His father-in-law, also in the restaurant industry, helped Wilder find food brokers and producers. “I knew exactly how I wanted to cook, so I advertised first for gardeners. I wanted the best produce and knew that relationship would be extremely important,” he says. What he didn’t know was what could grow in the desert. He discovered a bounty of local, native, and heritage plants: many varieties of corn, squash, and beans planted generation after generation by the Tohono O’odham and other Native American tribes, heritage seeds from the Spanish Colonial days, and wild plants of the desert. He could pickle or sauté buds from a flowering cholla plant, make sauces from the fruit of the giant saguaro, spice an entrée with local chile peppers, garnish dishes with wild purslane or desert sage, and take advantage of citrus orchards and meats and cheeses from the dairies and cattle farms. It all sounds so idyllic. And it might have been—for him. But he says it was the farmers who were the most challenged. He was one of the first chefs in the area to focus on “fresh and local.” Would they grow what he needed them to produce? “We live in a dry, harsh environment. We had to convince growers to believe in us, so they’d know we wouldn’t be the only customer…. Initially, we were buying everything produced, because we had to get them to trust us. I bought it whether I used it or not,” he says. When more restaurants followed his lead, he helped start a group called Tucson Originals to help market these independent restaurants. 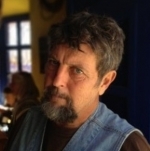 Meanwhile, he met Gary Nabhan, a University of Arizona ethnobotanist and one of the original founders of Native Seeds/SEARCH, a seed conservation organization. Nabhan introduced Wilder to the rich agro-biodiversity of arid-adapted plants, and Wilder is now the organization’s chairman of the board. It was through Nabhan that he learned you could eat cactus—after cleaning off the prickly parts, of course. “It didn’t seem strange to me at all. It seemed so logical. It matched my experience in Colorado, where we were so isolated that it was hard for suppliers to get to us. The people up on the mountain learned how to live very practically. They used the foods that were easily available to them. So this concept that you could eat off the land and cook what grew naturally was easy for me to understand,” he says. “I began to cook not only what was grown here but what had been grown here,” he says, including Sonoran Desert–adapted heritage fruit trees such as pomegranate or quince brought from Spain in the 18th century, now found at Mission Garden on the site of Tucson’s original birthplace. Wilder started looking at food in a different way. “I began to reverse-engineer the dishes that were already being cooked here. The chile relleno, for example. I wondered what else we could do besides roast it. What else could that stuffing be besides the traditional processed cheese? We stuffed it with lobster and brie, serving a jicama salad on the side,” he says. “By looking at what was possible and not just what was, I made use of my political science education after all,” he says. After operating Janos for 30 years, along with two other dining establishments, he closed them to open DKC in 2010, focusing on foods the immigrants were bringing to Tucson. “I wanted to explore food on a global front,” he says. He still creates a “Sense of Place” menu at DKC, but his interest has expanded. He’s moved toward more eclectic tastes found in Central America, the Middle East, and Southeast Asia. Social awareness is not new to Wilder. 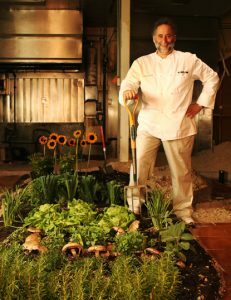 He’s involved in the community in many ways, including establishing his restaurant’s garden, also a demonstration garden, at Tucson’s Children’s Museum. He apprentices new chefs and teaches advanced cooking to local chefs—for free. He also hosts several fundraising dinners for charities each year, and is now partnered with the Tucson Medical Center to offer video classes on healthy cooking for the hospital’s staff and general public. “It’s changed 180 degrees since we first opened. We now have our own gardens. There are more restaurants downtown and more local gardeners,” he says. He now buys indigenous plants from NativeSeeds/SEARCH; squash, watermelon, and tepary beans from the co-op farm on the Tohono O’dham Nation; and watercress from an abandoned high school that’s football field has been transformed into farmland. With more and more people across the country following the movement to eat fresh and local, what might have seemed foreign then is so natural now, he says. It’s why he opened an event facility, The Carriage House, last year. He caters events and teaches native food cooking classes there. Earlier this year, he also hosted a cocktail challenge there to pick a drink for the Paris event. After two days of hectic preparation, the event went well. “From agave spirit to the spirit of agave the evening was a celebration of the flavors from our home,” Wilder wrote in a blog of the experience.